From left, University of Guelph (Ontario) team members Everett Snieder, Nicole Ludzki, Emily Angermann, Madelaine Prince, and their faculty adviser, Andrea Bradford (not pictured) receive their first-place award from WEF President-Elect Tom Kunetz. Photo courtesy of Oscar and Associates. 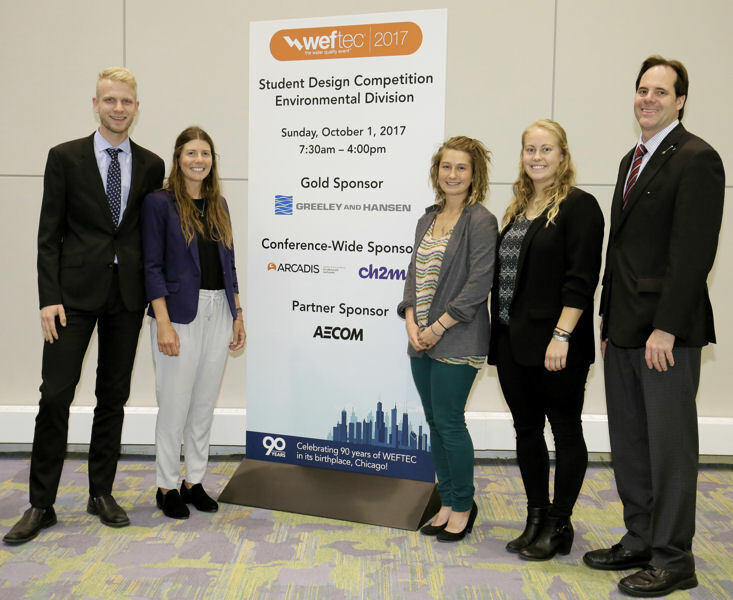 Teams from the University of Guelph (Ontario) and the University of Colorado, Boulder, walked away from the 2017 Water Environment Federation (WEF; Alexandria, Va.) Student Design Competition as winners. 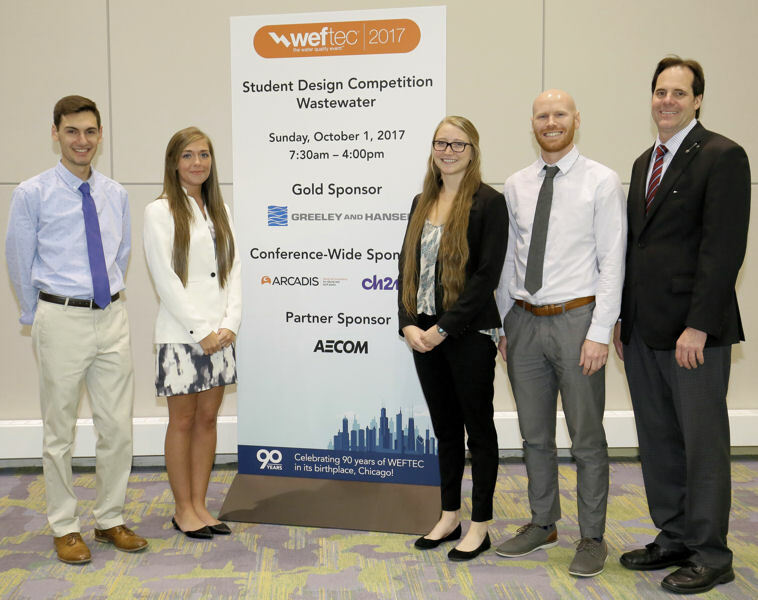 A record number of teams from 17 schools representing 16 different WEF Member Associations participated in the competition, held during WEFTEC 2017. The University of Guelph team’s project, “Stormwater Management Feasibility Study for Exhibition Place in Toronto, Ontario,” won in the environmental design category. This was the first win for the university team, which represented the Water Environment Association of Ontario. Other teams who placed in the category were the University of Tennessee (Knoxville) in second, Johns Hopkins University (Baltimore) in third, and University of South Florida (Tampa) in fourth. From left, University of Colorado, Boulder team members Elias Katsoulas, Riley McConnell, Sarah Vander Meulen, Alan Bracewell, Dillion Rodenbaugh (not pictured), and their faculty adviser, Christopher Corwin (not pictured) receive their first-place award from WEF President-Elect Tom Kunetz. Photo courtesy of Oscar and Associates. The University of Colorado, Boulder team’s project, “Biosolids, Digestion, Dewatering, Handling Evaluation and Design,” won in the wastewater design category. This was the third win for the university team, which represented the Rocky Mountain Water Environment Association. Other teams who placed in the category were the University of (Vancouver) British Columbia in second, Northeastern University (Boston) in third, and North Dakota State University (Fargo) in fourth. Both first-place teams received certificates and their Member Associations will receive a $2500 award. Greeley and Hansen (Chicago), Black & Veatch (Overland Park, Kan.), CDM Smith (Boston), and HDR (Omaha, Neb.) sponsored this year’s competition. Student Design Competition judge Laurissa Cubbage from HDR (Omaha, Neb.) talks to a team after their presentation at WEFTEC 2017. Photo courtesy of Oscar and Associates. 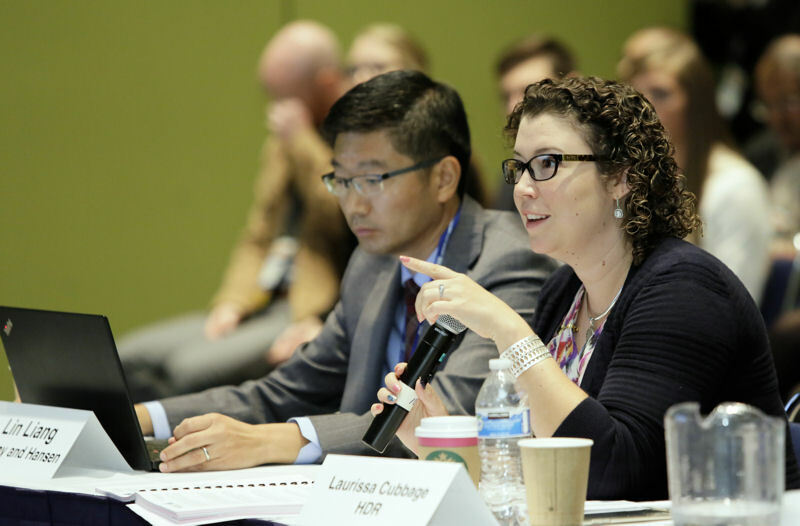 As a WEF Students and Young Professionals Committee program, the competition promotes real-world design experience for students interested in pursuing an education and career in water and wastewater engineering or science. Teams evaluate alternatives, perform calculations, and recommend practical solutions.